This is a text excerpt of Mark Cheng’s Prehab Rehab 101 video. You can review a variety of preview clips here. In Prehab-Rehab 101, The Groundwork Progressions, we move from the most fundamental developmental positions up to half-kneeling, the precursor just before we get to standing in symmetrical stance, split stance and single-leg stance. The five positions we discuss in high detail in the video will give you the tools and the eyes you need to break these exercises down and use them with your clients, athletes and patients. In each of these positions there are breakdowns and highlights for you to understand how to train in these positions for better mastery and ownership of all of the movements that go into higher-level strength and performance. This will show up as efficiency on the field for your athletes—higher performance with less strain. 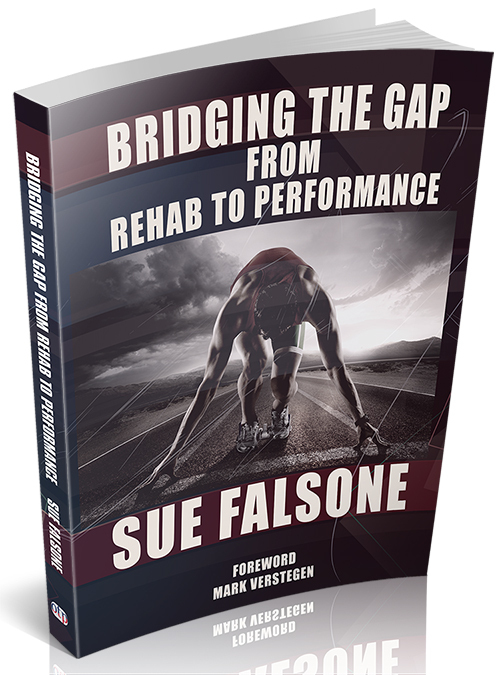 For those of you working in a rehab setting, this is essential for getting your patients back into the game of life without pain. In the crawling progression, we’ll have people on their knees, their feet and their hands; they’ll have six points of contact. Whether the feet are toes down, with the balls of the foot in contact with the ground, or whether the instep is down—either way works for the initial setup. As we begin this progression, we work on first looking straight ahead and, ideally, looking up higher. Similar to babies, when they start to crawl, they don’t just look at someone right in front of their faces. They begin to look up, just like an adult would. If you were watching the video, you would see that all three of our models have different ranges of ability. We wanted to show you the ranges and teach you how to work at the level you or your clients are capable of. From here, keeping the elbows locked, the next position is to drop the chest down and then prime it back up. We’re looking for the head and neck to be able to look forward or look up even taller than where the eyes would go when parallel to the ground. Breathing stays loose throughout this phase. Once we have this basic position, being able to break contact with any one of the limbs at any time is a next test, but before that, we would work on the head and neck. I’d have you look to the left, like you’re trying to see something that drew your attention. Then look back to the front at someone who’s about your height right in front of you, and then to the right. For those of you who are coaches, you would look for a shoulder that may dip down; if you notice someone turns the head to the left and dips down onto the right shoulder, that’s a key. The elbows should stay locked with the feeling of engaging the shoulder stabilizers and spreading the chest. However, it’s all about moving the head and neck and being able to move the line of sight and actively engage that line of sight—not just turning the head without the eyes. We would want to be looking at detail on the walls or at detail in the surroundings because later it’s all about moving and reacting from here. Notice the lower back would not be hunched. For someone who has a rounded lower back, we want to cue to drop just a little so it’s even. The beauty of working on these progressions is it allows us to feel firsthand when things are difficult. Take the time to address things. Don’t be afraid to give clients the stepping stones they need for success. If you’re trying to do ground work and your older clients are resistant because they don’t feel able to comfortably get back up, give them the stepping stones they need. Maybe it’s just propping the shins or knees against a bed or couch and they’re able to put their hands on something else. Being able to work shoulder packing is a huge benefit for our older adults. As they’re in the position, they’re engaging all of the four knots at the same time. The shoulders and hips are engaged, but then, once we start cross-crawling in place, we are now working on both mobility and stability. We have to stabilize and we have to be able to mobilize. The side that comes up is the side that’s mobile. The side we’re based upon is stable. As far as the line of sight, ideally you want to be looking at about your same height in front of your body. A baby would crawl because it’s trying to look at something and then move toward something it sees. Often when we work the cross crawl, we’ll see people looking straight down, but that doesn’t provide the same level of benefit. Encourage a higher viewpoint. The whole idea is we’re moving because we see something we want to get to, so it’s about the head, neck and the torso. The hips also move, but the eyes are important. I can’t emphasize this point enough. Where you’re looking is super important. We’re alternating between mobility and stability back and forth between left and right in a diagonal pattern. We’re engaging the eyes, the head and the neck from different contexts relative to the ground—mobile stability, as well as reactive mobility, keeping the head and chest high off of the ground. If you start sagging the chest down toward the ground, your shoulders are not stabilizing. Different levels of strain or effort are important to notice. Let’s go through the crawling progressions. We start off with six points of contact—head, neck and arm movements and drills. Then we go into the arm movements. These are the same sort of progressions, just with a different frame of context in relation to the ground. Now let’s go into the cross crawl, just breaking contact with the ground. One of the things you want to note is an excessive swing of either the hips or the shoulders. The chest stays high, tall off of the ground. You’re just trying to break contact with the ground. It’s not a contest to see how high off of the ground you can get. It’s not a bird dog. It’s gently breaking contact with the ground and having control…while still breathing. If these ranges of motion are foreign to a person, the metabolism is working overtime. These may not look like high-intensity workouts, but if the nervous system isn’t used to this, the person is burning a ridiculous amount of calories trying to tap back into these movements. With the rocking in six points of contact, we’re juicing the four knots, changing their reference to the ground. We’re rocking back and forth nice and easy—not too far forward and not too far back. We’re giving another framework for the brain to appreciate not only the contact points, but also how the limbs are knotting themselves back into the body. Once we have these basic bodyweight progressions, we start looking at force. When we own control over bodyweight and over the body itself, then we challenge it. For strength, we’ll use a light sandbag and pull it back and then launch it forward, again pull it back and launch it forward. Here we have three points of stability, but we also have to be able to issue force from the free hand. When you move to the other side, if you notice a big discrepancy in terms of ability or stability—maybe on one side your client is super stable and on the other side, one leg keeps flying up—that’s an indicator. The side of greatest challenge is the one you want to work on more. The next level of progression in crawling is to go from six points of contact to four points. To do that, rock back under the forefoot and rob the knees of contact with the ground. This is the “bear” position or the bear crawl. The hips have to be lower than the head. Ideally, the hips have to be even lower than the shoulders. This becomes a little more difficult—not only because it requires strength in the core to keep the knees up, but also to have flexibility in the hip. If the hips are limited in terms of flexion, this is difficult. When things become challenging, the line of sight almost always goes down. The trick here is to make it so we’re practicing so the line of sight is forward. Our eyes go down because we want to sight the ground when we don’t trust our balance. We’re looking for the ground so we can catch ourselves. That’s a primitive reflex. Instead, we want to keep the eyes engaged forward. In higher-level training, we begin issuing force, like dragging the rope with three points of contact—just the feet and one hand—throwing the rope or even doing the same as we did with the sandbag. Now for the hardest progression. When you change the elevation or change the angle relative to gravity, crawling becomes climbing. This can also be a way for some of your elderly clients to access the crawling pattern. For them, working from the top down is more important than working from the bottom up. For your athletes, you might have one hand and foot on the floor, while the other two points of contact are on the wall. Here we are at an angle, looking up toward the ceiling. It’s tempting to look forward between the hands, but we want to look more toward the ceiling. Bring your hands a bit closer to each other, so the hands are pretty much even with the shoulder line. From here, we work on that cross-crawl pattern. Ideally at this stage, we want to minimize the rotation of the hips, which is breaking contact with each part of the ground. If we want to up the ante when the person is a bit more advanced, the next part is very important—you’ll go to the side. This is not for the elderly clientele unless they’re very advanced, but this will work well for athletes, especially your athletes who need to be functional and strong in a variety of contexts. The next position in our crawling progression is diagonal, where we have two points in touch with the ground and two points in touch with the wall. Being able to stabilize is important. You’re not going to be able to cross-crawl in this position because it’s too unstable, but this is a good way to learn to stabilize. Feeling the ground with different points of contact is very important. The wall is a point of stability, but the ground is also a point of stability. Being able to keep the body in position, then move the head and neck looking left and right is valuable. Progressing further, it’s hands down and feet up, going into partial inversion. It looks like it’s going to be the start of an elevated push-up, but instead keep the hips and knees flexed. You don’t want to be looking down; imagine you’re crawling downhill. This is challenging—not only in terms of keeping contact with the wall, but also in terms of stability. In terms of the downward cross-crawl, imagine if you’re doing an uphill crawling or climbing pattern, you’re now climbing downhill—a reverse climb, climbing down head first. For animals in quadruped, that’s pretty standard. If you’ve climbed up a tree, you have to be able to climb down, and to look in the direction in which you’re climbing. Crawling is ordinarily something most humans don’t do enough of, and it’s very rich for core development. All of the groundwork progressions we cover in the Prehab Rehab video are valuable for your adult clients, your injured patients and your athletes. Learn the progressions and discover what to look for as compensations and your clients will be well served. This was a text excerpt of Mark Cheng’s Prehab Rehab 101 video. You can review a variety of preview clips here. 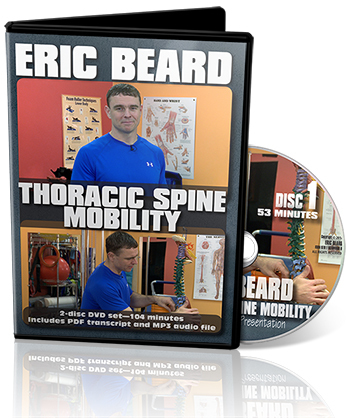 In this lecture and demonstration video, Eric Beard discusses the structure, function and common impairments of the thoracic spine. 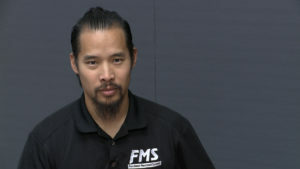 He'll show you the assessments he uses to review the t-spine, and describes and demonstrates his favorite corrective programming to address issues found during the thoracic assessment. You've heard of RNT, but do you really know what it means -- How it was created and what is its purpose? Here Gray Cook explains how RNT came to be used, and his thinking behind reactive neuromuscular training.